No Bones About It: Fishbone is down to two original members. Update: Due to weather-related delays, The Fishbone concert originally scheduled for Friday, Jan. 7 at the Blank Club in San Jose has been postponed until January 30. IN 1985, I went to a show at Santa Clara University. Admission was $3, and the band playing was called Fishbone. I had never heard of them before, but a group of friends was going, and I was invited. The small basement was packed with punks, mods, skinheads, rude boys and everyday music lovers. I had no idea what to expect, and then it happened; Fishbone hit the stage, and my life changed. Within the first few notes, lead singer Angelo Moore was doing flips into the crowd, quickly joined by keyboardist Chris Dowd. The crowd broke into a pit, motivated by the ska, punk, funk and metal coming from the stage. The basement resembled a steam room, as everybody was completely drenched in sweat. My '60s suit looked as though I had driven through a car wash with the windows down. My face was a blank expression. I didn't know how to react because I had just experienced something that could never be duplicated. How can you describe something that's never happened to you before? I was at a loss for words, and slowly my expression turned into a giddy smile as my friends and I exited the show. I had a hard time sleeping that night. My body was still amped with adrenaline and visions of the most exciting live band I'd ever seen. Twenty years later, I still remember that Santa Clara show like it was yesterday. 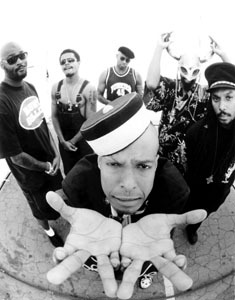 Fishbone would become my favorite band, a huge influence on my own band Skankin' Pickle. To date, I have seen Fishbone 173 times. From the glory days of One Step Beyond to the Stone in San Francisco to the six-hour drive to Los Angeles to see the group open for the Dead Kennedys at the Hollywood Palladium. In 1988, while attending De Anza College, I was faced with a choice of seeing Fishbone or taking a final exam. I failed English 101 that quarter. I've always wondered why Fishbone didn't make it in mainstream music. Racism was a part of the equation. Fishbone was lost in a shuffle for being blackit was never given the promotion that its contemporaries like the Red Hot Chili Peppers and Jane's Addiction received. During the '90s ska revival, as band after band that cited Fishbone as an influence rose, Fishbone remained in anonymity. I also feel that record companies never knew how to market the band, and now, due to shady business decisions, Fishbone tours relentlessly to pay its bills. It's sad to see a band that has influenced so many struggle on the road just to make ends meet. But to be honest, Fishbone's albums became less accessible, beginning with 1993's Give a Monkey a Brain and He'll Swear He's the Center of the Universe. Four of the six original members left the band. With only Angelo Moore and bassist Norwood Fisher remaining, it seems strange to call the present lineup Fishbone. The last few times I've seen the band, my heart hasn't pounded like it used to. It's like watching a great cover band doing Fishbone songs. And to watch a swarming crowd of youthful energy degenerate into a 21-plus drinking crowd is demoralizing. But I've become good friends with Angelo and Norwood. I've released three poetry CDs for Angelo on my record label (Asian Man Records) and have spent hours on the phone getting drunk-dialed by the band. I can still talk Fishbone for hours. The subject opened a rift between me and Tom Morello on the 2004 Rock Against Bush tour. Now here I am, 20 years after seeing them for the first time, hoping Fishbone can still deliver the punch that gave me so much inspiration and energy back in 1985. Regardless of years and circumstance, I would put my life on the belief that Fishbone can still deliver more truth and soul than all of the mall punk bands making millions. Perhaps Fishbone doesn't care about fame and fortune. Maybe they just want to play. Update: Due to weather-related delays, the Fishbone concert originally scheduled for Friday, Jan. 7 at the Blank Club in San Jose has been postponed until January 30. If you purchased tickets in advance, they will be valid for that date or you can get a refund by contacting TicketWeb. Fishbone performs January 30 at the Blank Club, 44 S. Almaden Blvd, San Jose. Call for details: 408.292.5265. From the January 5-11, 2005 issue of Metro, Silicon Valley's Weekly Newspaper.